Enjoy perennial lush green lawns with quality instant turf from Melbourne’s leading professional turf installers Scapeworks! At Scapeworks, we strive to deliver you with a superior range of instant lawn and turfs, as well as an exceptional level of expertise and personalised service to support you in making an informed decision. Wherever your private residence or commercial property is in Melbourne, you can trust Scapeworks’ premier team of instant turf layers to get the job done right, every time. Conduct a tailored consultation with you to determine the best instant turf option for your circumstances. Evaluate influential factors such as soil type, water use, location of the instant grass, pets and more. 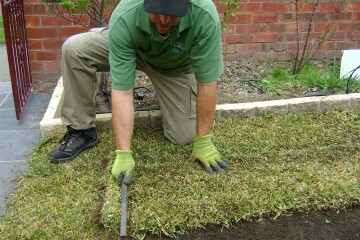 Professionally install the selected instant turf at your Melbourne property. For more information on our premium range of instant turf and lawns, contact Scapeworks on 03 9778 5511 today. Requiring minimal maintenance with wear resistance properties and highly adaptable to a range of environments, Scapeworks’ instant turf is a great investment for both residential and commercial properties across Melbourne. Trust Scapeworks for the best instant turf prices in Melbourne. Contact us today on 03 9778 5511!